UNITED NATIONS, Mar 13 2017 (IPS) - Just this year, public and private stakeholders from around the globe marked the one-year anniversary of the United Nations Sustainable Development Goals (SDGs). The milestone served as an important reminder of the fifteen-year framework that is now in place. The SDGs were built around a common, global agenda with a clear set of 17 development objectives designed to alleviate poverty by 2030. The result of the broadest consultation process ever undertaken by the UN. However, in order for the 2030 Agenda to be truly successful, both the public and private sector must embrace its framework for policy and investment. That said, beyond the confines of the United Nations, it is becoming increasingly evident from extensive, external consultation with both the public and private sector—that there is still a great deal of practical education and advocacy work to be done. Many companies are still grappling with what exactly the SDGs are and with planning efforts to address them. Learning from our ongoing experience it is essential that we cast a wider net and continue to help companies understand and translate the SDGs into meaningful action. There is a critical need to determine how we unpack the SDGs in a way that they are no longer mysterious to the private sector, diplomatic community and governments. For those who have been not been involved in the implementation and preparatory discussion of the goals, there is a real need to help educate a larger community of practice and facilitate knowledge sharing at all levels. With this in mind, UNITAR, and the Sustainable Development Goals Fund have prepared an important online training course to deliver innovative training to address the needs of business and institutions. The course will increase understanding and provide expert insight as part of a new e-Learning tool and curriculum to provide specialized training modules to promote grounded knowledge about the SDGs. 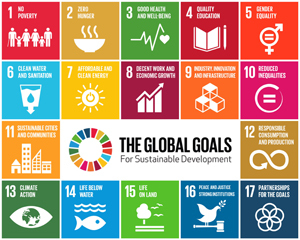 By breaking down the 17 goals to meet the needs of business, the SDGs can be firmly adapted to showcase clear and meaningful targets and plans. The course also provided case studies, examples and indicators of how public-private partnerships for achieving SDGs can be shaped. It is based mainly in the experience shared by the SDG Fund´s Private Sector Advisory Group and partners. What’s needed now is for the UN to allow for governments, civil society and companies is to understand the key principles so they can build on their own internal systems of management, performance indicators and actual methodologies. We also recognize that companies are learning from their peers and like their public sector counterparts have begun to see the benefit in building stronger community relations, fostering employee engagement, and continuous learning. We must expand our often “UN-centric” communications and provide the basic understanding of the goals to a larger network, including those not traditionally working on the subject of development or the global goals. This requires some fresh thinking. Given the complexities of the agenda, for example with the multitude of targets and indicators, we must break it down and offer concrete and hands-on examples of projects and areas for collaboration. We must work harder to demonstrate the value proposition for implementing the goals. More broadly– how can the UN help the public and private sector understand the nuances and complexities of what is considered the new 2030 Agenda? Quite simply, there are numerous areas where individuals and business can benefit. What are some of the solutions or best practices for building partnerships– especially at global and national levels? There seems to be no better time to truly highlight the compelling story of the SDGs’ especially their intrinsic value and how the SDGs can be turned into public and private strategies that work to everyone’s advantage. If we are to fully advocate for more sustainable development around the world, then we must continue to work with external partners, using new tools and through educational training. We are no longer bound by silos and recognize the need for expanded collaboration with government partners and new actors for successful implementation of the new agenda. There is a clear role for everyone to play and an opportunity to build new and effective SDG partnerships.